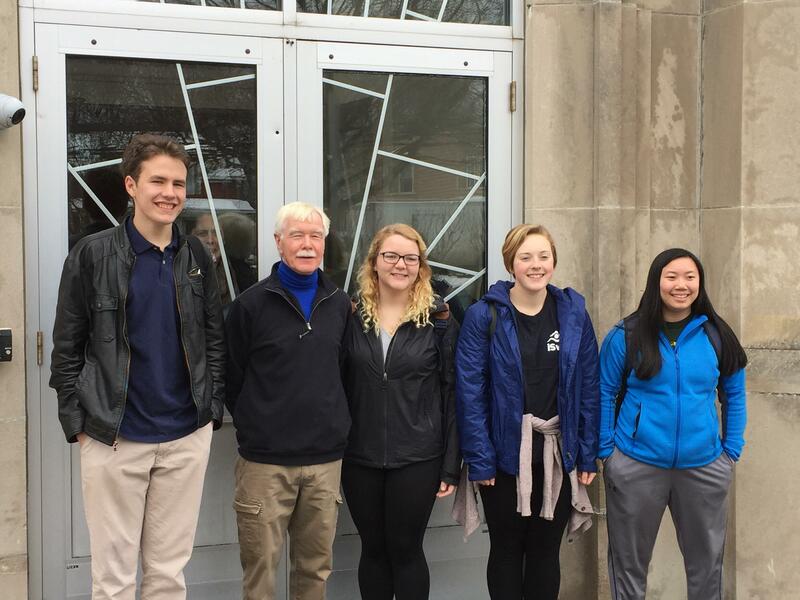 Bon voyage to our students participating in this year’s exchange to Belfast, Northern Ireland, from February 15-25. Traveling with Mr. Hodgkinson are Jackie Leblanc ’17 of Albany, Louise Metz ’17 of Troy, Jack Ross-Pilkington ’17 of Stuyvesant Falls, and Hannah Nye ’18 of Rotterdam. Pictured L-R: Jack, Mr. H., Jackie, Hannah and Louise. 2017 marks the ninth year of the program in which DS students stay with host families and attend classes at Lagan College. In addition to attending classes on Irish politics and Irish language, our students will take a political tour of West Belfast on the Falls and Shankill Roads, participate in a Twinning with PeacePlayers International, tour the Crumlin Road Gaol, visit Stranmills and Saint Mary’s University Teaching Colleges and meet our visiting student teachers for 2017, attend an Ulster Rugby match, go wet bouldering in Newcastle, visit the Antrim coast and see the Giants Causeway and the Carrick-a-Rede Rope Bridge, visit Saint Patrick’s grave, and spend a day in Dublin, the highlight of which is visiting Trinity College and touring the Old Library. We wish our group, and our friends at Lagan, safe travels and a wonderful time. Follow along with their adventures on Instagram. Why Doane Stuart and Lagan College? The Irish Exchange Program at Doane Stuart represents the passionate dream of Seamus Hodgkinson, who left Belfast in the ’70s to escape “The Troubles.” A native of Belfast, Northern Ireland, Mr. H (as he is commonly known) left his hometown and ventured off to New York. His trip took him to Albany, where he was employed as a science teacher at a newly merged Protestant/ Catholic college preparatory school named Doane Stuart. Mr. H envisioned an exchange program that would bring Catholic and Protestant students from Northern Ireland to America. 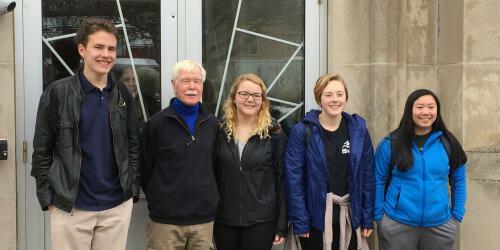 He believed that through this program, the students from Northern Ireland could learn, and share in a multi-cultural environment, which embodies tolerance, respect, and peace. Lagan College, formed in 1981, began with 28 students (14 Catholic, 14 Protestant), similar to Doane Stuart School’s origins. It is Northern Ireland’s first integrated, planned co-educational college; a model for others to follow. From its humble beginning with 28 students, Lagan today has over 1,200 students. We are thankful to our Lagan friends for so kindly welcoming our students each year, and to their families for opening their homes. We are proud that the partnership has extended into its ninth year with Doane Stuart students visiting Lagan. Belfast, Northern Ireland is truly divided, politically and religiously. The thirty-foot walls that were built to divide Catholics and Protestants stand as a very visible reminder of the conflict. While efforts have been made to heal the divided society, only 5 percent of the schools in Northern Ireland are integrated (Protestant and Catholic). Northern Ireland is a model for all societies that have been torn apart by religious difference, intolerance, and fear. Integrated Education is the path for peace.